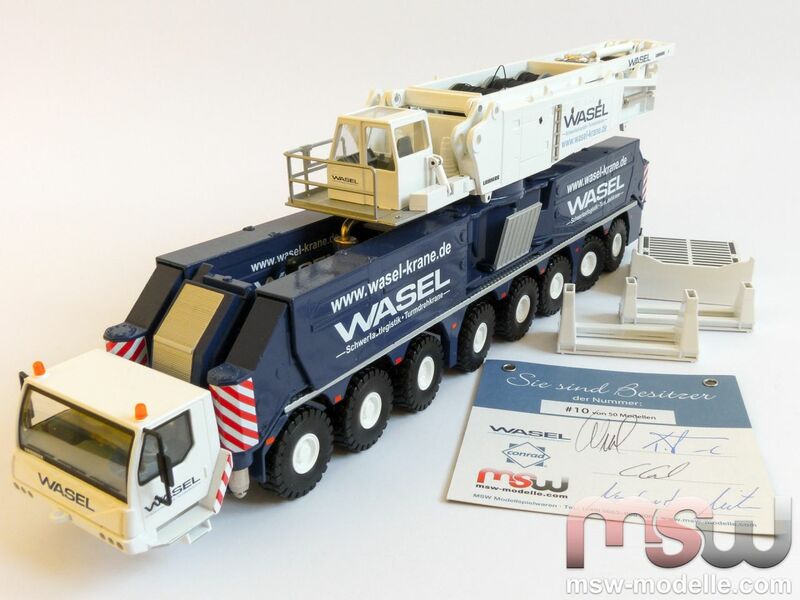 2014 is really a very important year for MSW Modelle since Norbert and Sylvia Mietz can look back on 20 successful years of selling die cast models including superior full service. 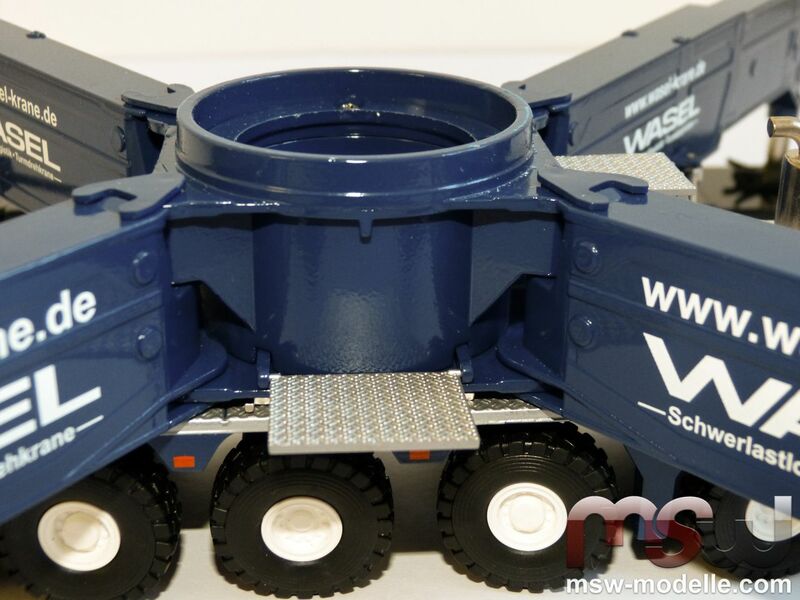 And within this 20th company year MSW Modelle presents a real firework of exclusive models. Fascinating versions of Conrad's LTC1045 or the WSI LTM 1050 are only two great examples. 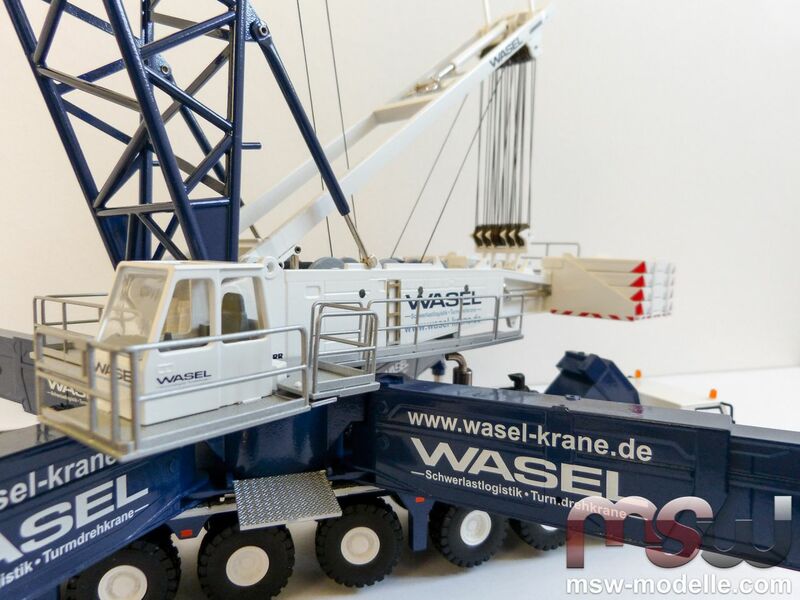 But the greatest Highlight is the 2014 anniversary model, a Liebherr LG1750 SL7DHS painted in the colors of the Bergheim based crane company Wasel. 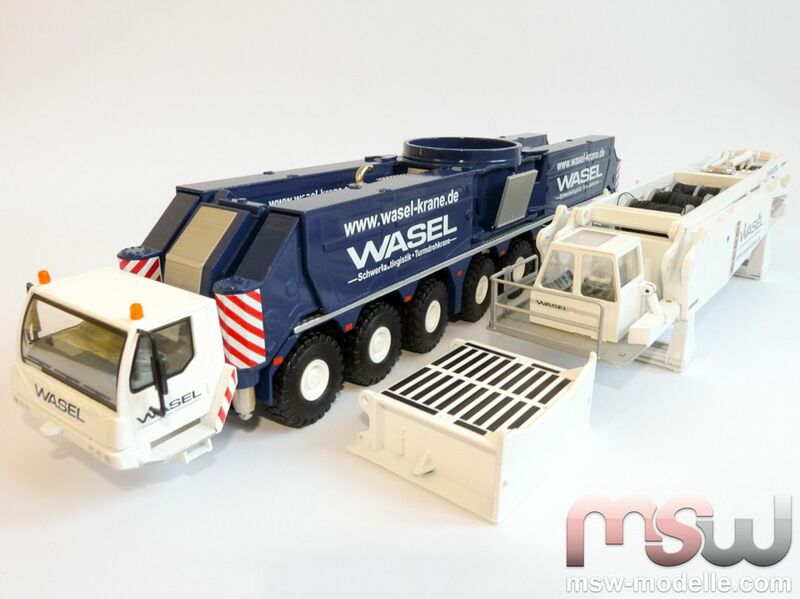 Norbert Mietz and Wasel developed the idea already in Mai this year. 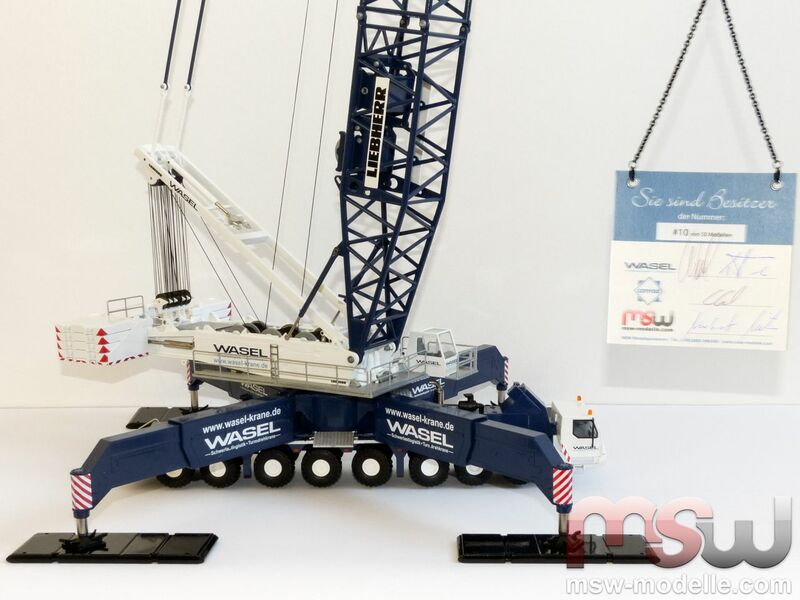 And with some phone calls, meetings, planning sessions and final approvals this great model could be shipped in November 2014. A personal highlight during the preparation phase was for sure a visit of the real crane on a wind power construction site. 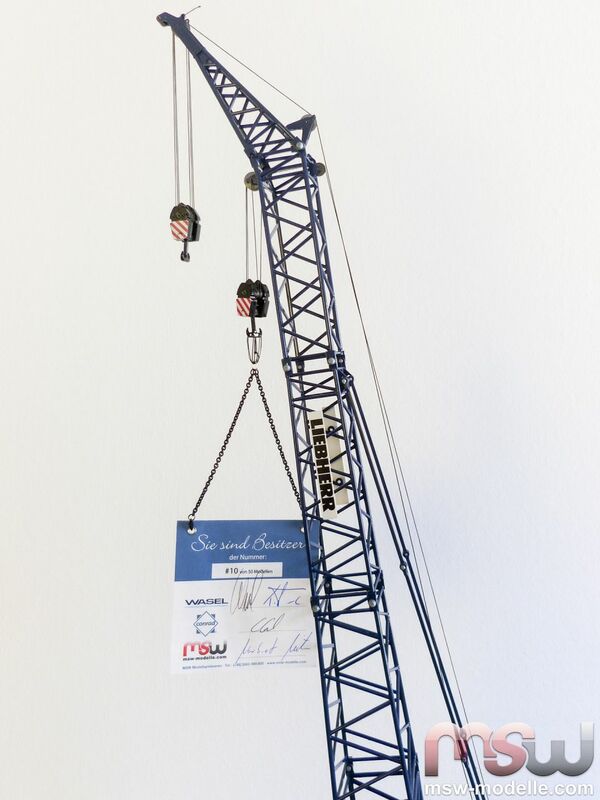 This was required since Norbert Mietz wanted to make sure that the crane model comes with 100% accurate decals. It was really a fascinating visit. 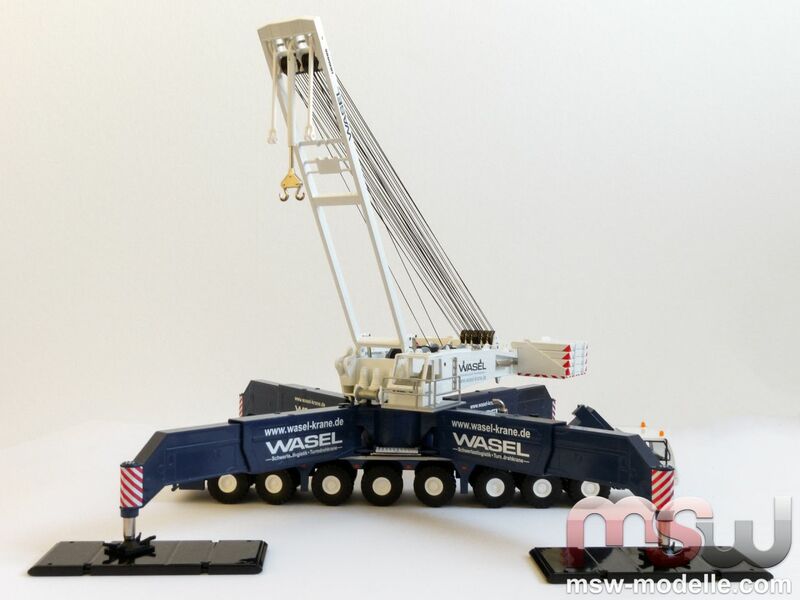 The anniversary model comes – similar to the former Grohmann or Maxikraft liveries - with derrick and wind power plant runner. 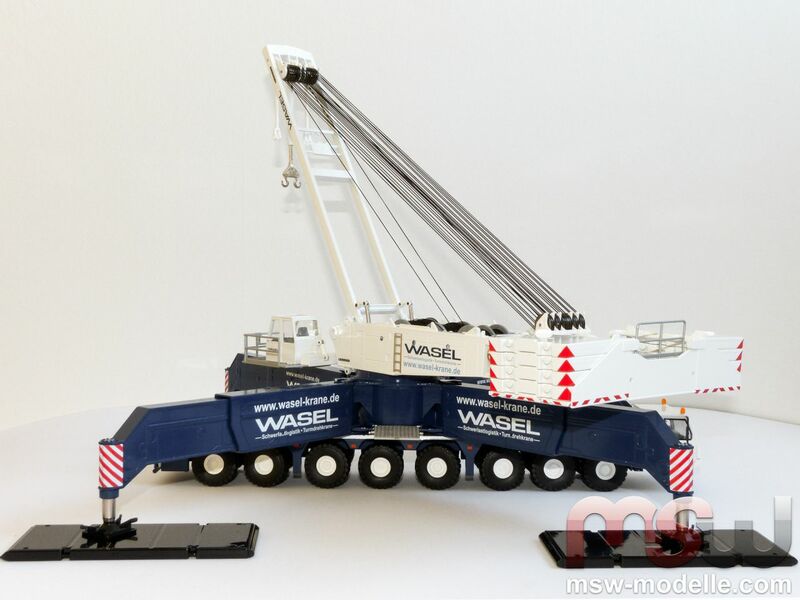 And the anniversary set is additionally delivered also with superstructure extension (which was available only with the official Liebherr version), the two transport frames and the two small hooks. So all in all a really unique combination which never was available on other LG1750 liveries. 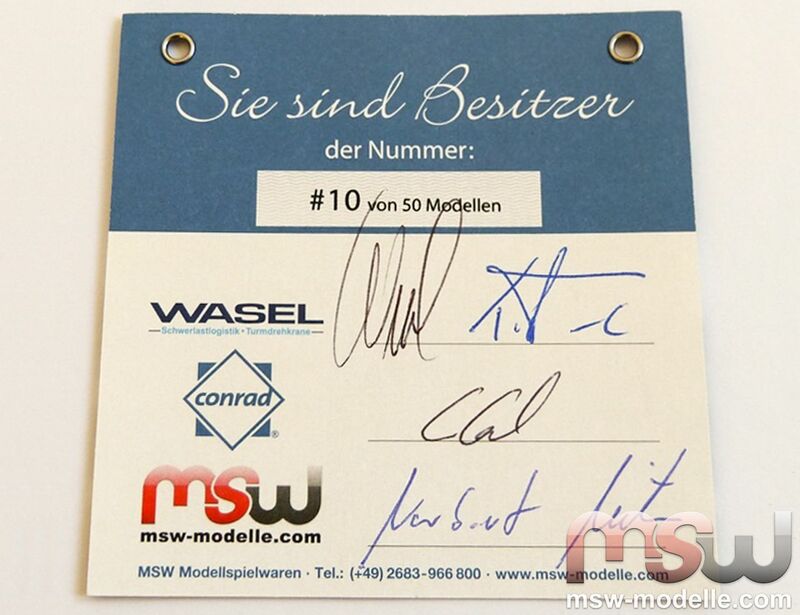 ..while on the back side we can read the signature of all companies involved into this project, Wasel, Conrad Modelle and of course MSW Modelle. And also this certificate looks really superior and different. 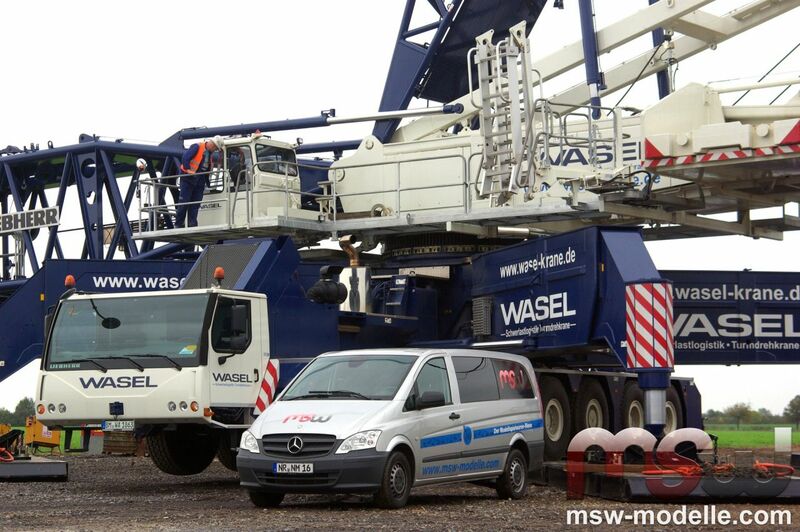 LG1750 Wasel with assembled superstructure, transport frames and the superstructure extension. 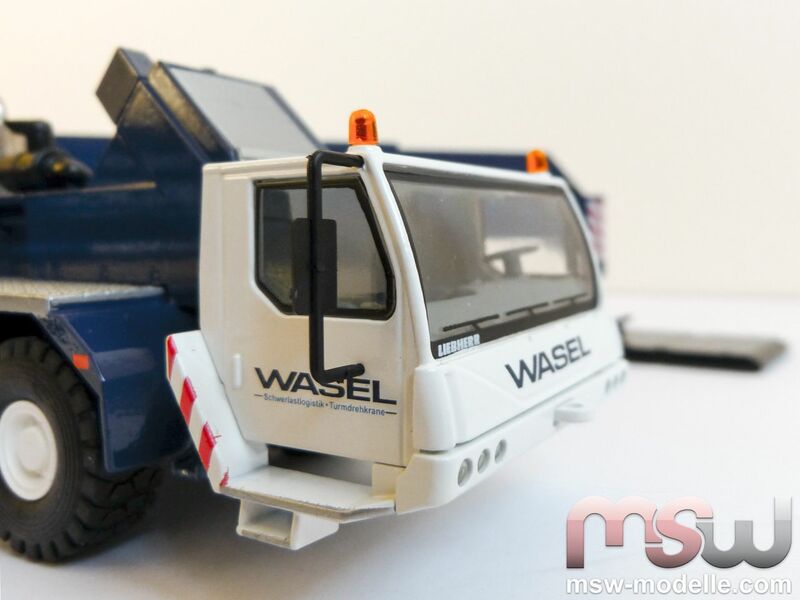 The blue Wasel livery is for sure one of the nice looking ones. 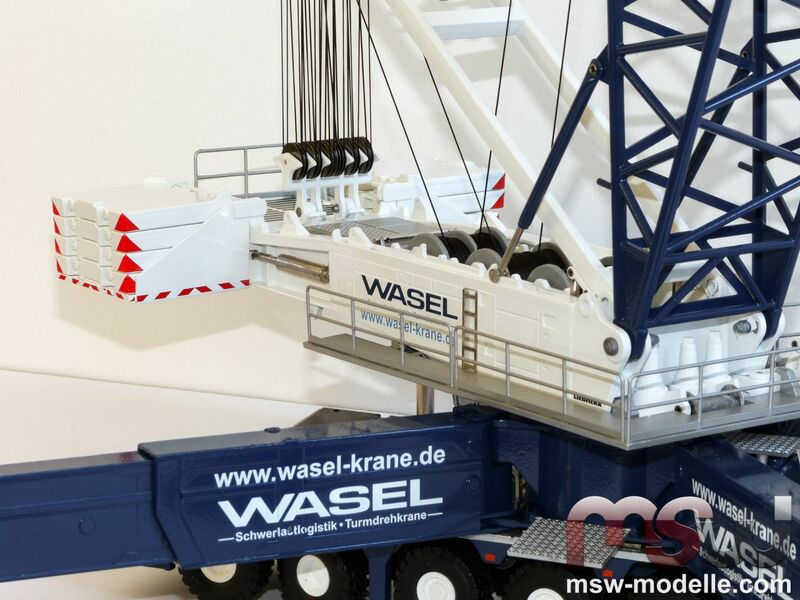 The Wasel name can be read on the massive outriggers as in reality. 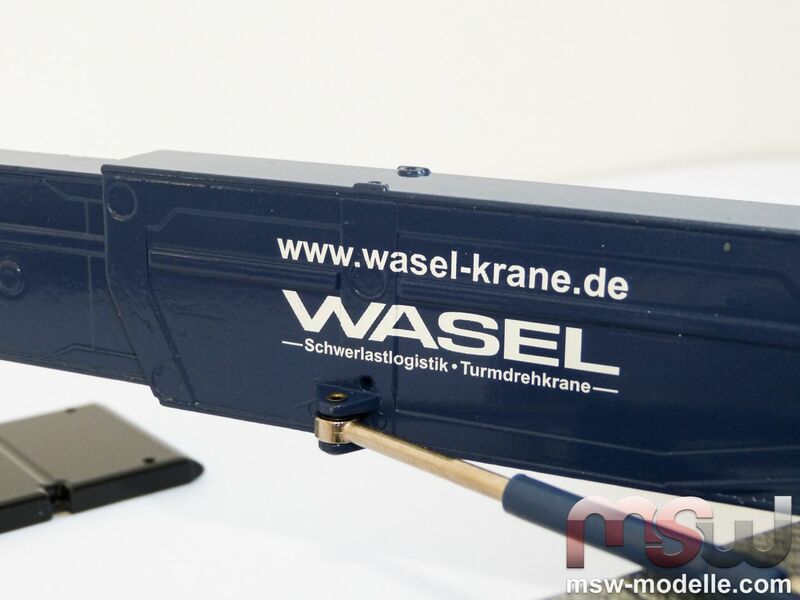 And even on the inside outriggers the Wasel logo appears perfectly authentic. As in reality the letters appear slightly smaller. The superstructure decals are correctly copied as well. Conrad also realized on this LG1750 version a quick connection made of metal; plastic is not used on this critical connection. 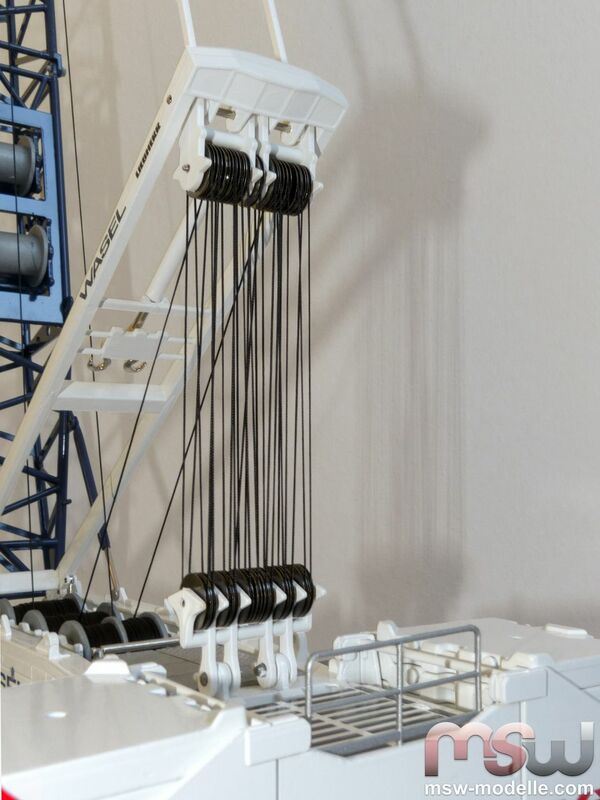 Just by the touch of a button the superstructure can be easily disconnected from the carrier. And of course this new connection is much more robust. Characteristic for the LG crane are the robust X-type outriggers; all forces are guided only into the frame underneath the slew ring. It is also a great feature that all outriggers can be simply removed by loosening the plastic bolt. A 505 kw Liebherr diesel engine is installed on the real carrier. The engine cooler is clearly visible, pointing to the front. Small hydraulic cylinders would move the four outriggers. 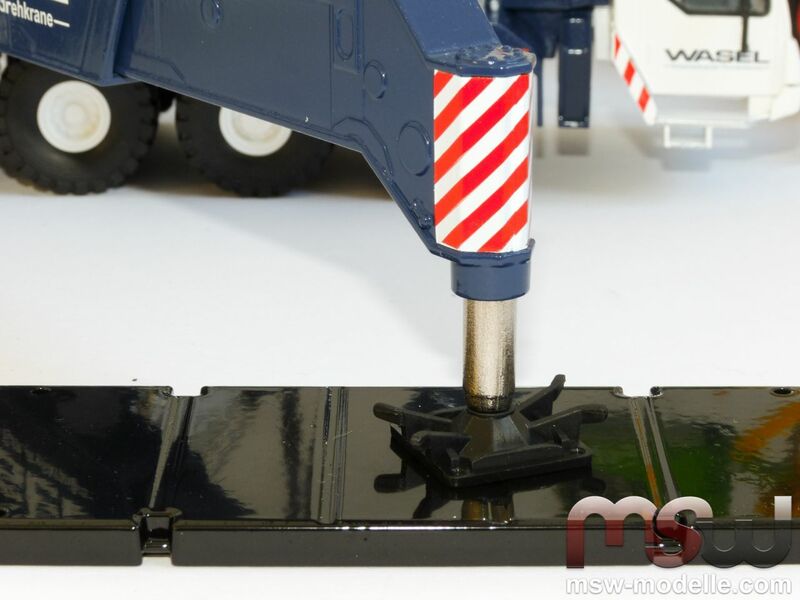 And even the walking surfaces on the model feature the anti-slip surface as in reality. All four outriggers are equipped with an internal screw thread for an authentic look and stabilize the crane very good. 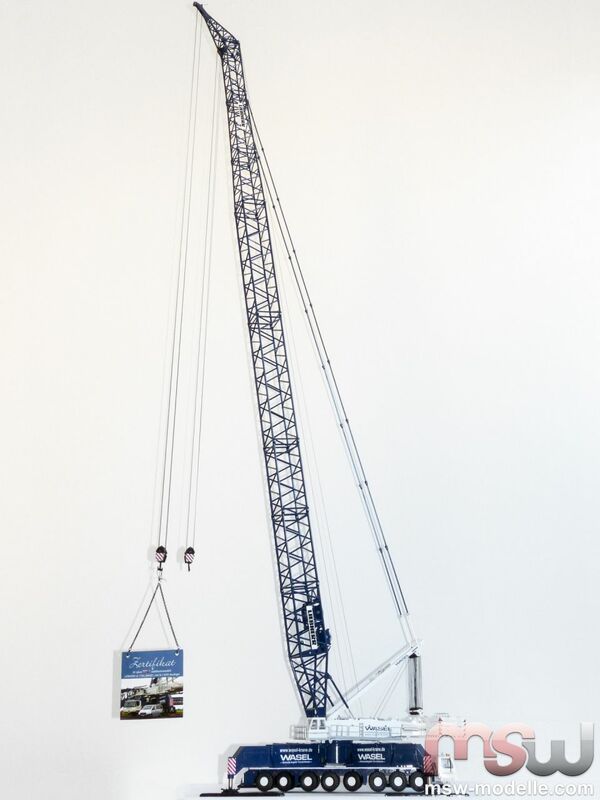 For the shown SL8HS version – which is without derrick mast – the outriggers need to be extended to the maximum outrigger base of 32 times 32 cm (or 16 times 16 m) on the real crane. When equipped with derrick, the outriggers are not extended with a support base of 12 m times 12 m.
The crane carrier's back with access ladder, railings and lighting. Of course the beacon light is also not missing. Conrad'S LTC1045 is supporting the LG assembly. 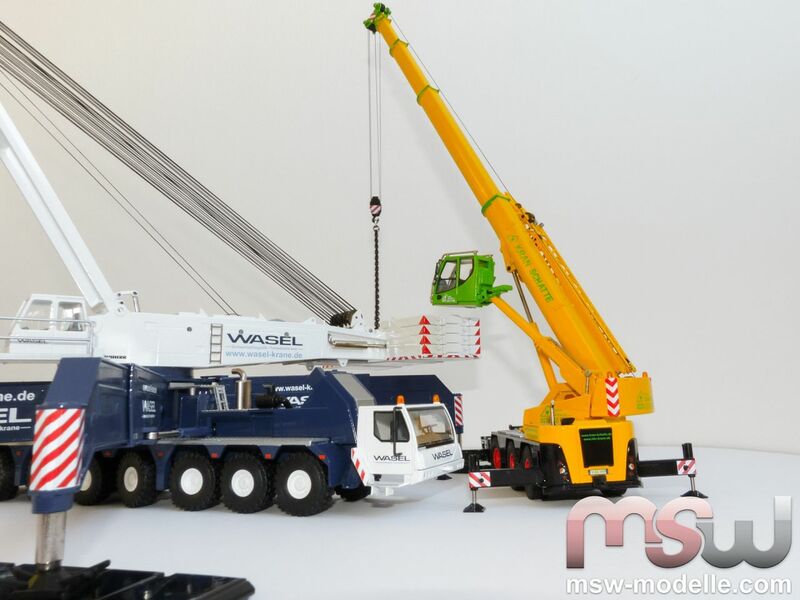 Even though this crane would be too small in reality, both models are a great combination. 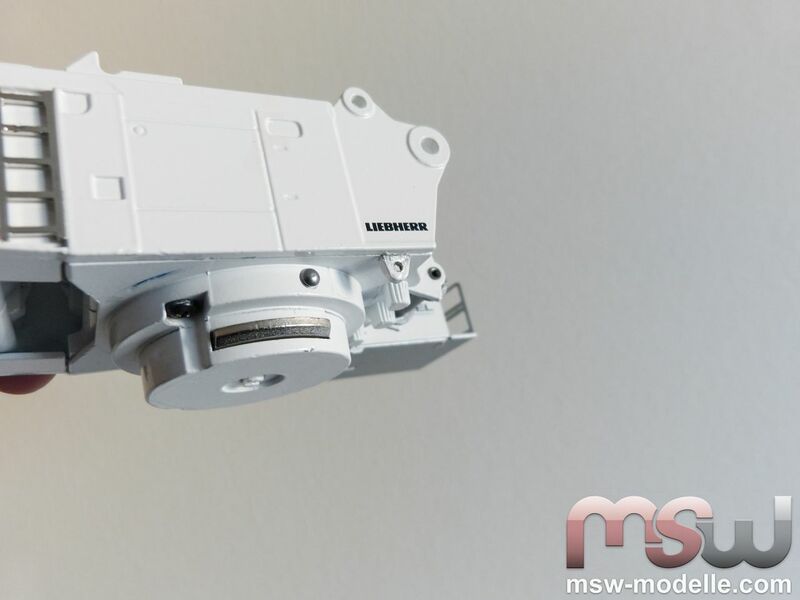 And this LTC1045 can be selected as one additional bonus model out of various models from MSW Modelle. 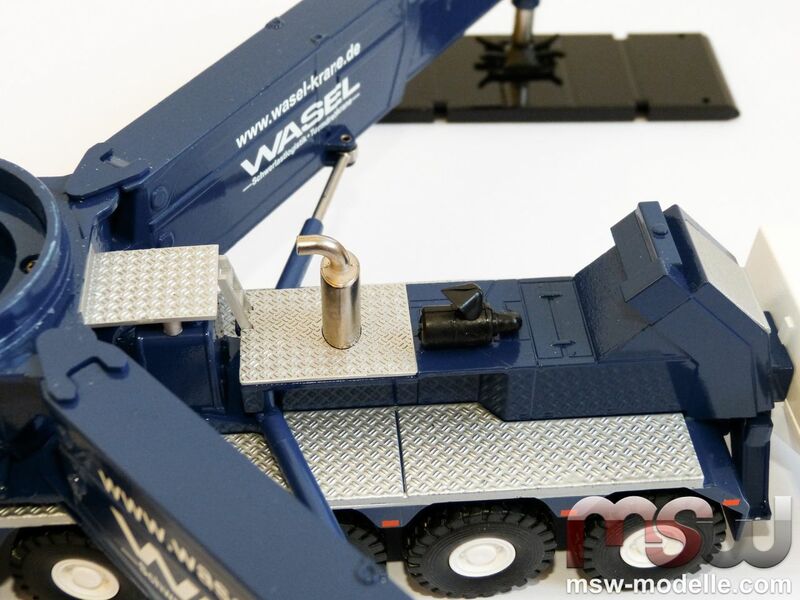 The LTC 1045 is only one example of the exclusive models from MSW Modelle in 2014. The superstructure extension is assembled; a small railing would avoid falling in reality. Since the slewing radius is larger with the extension, the LG1750 can work with less counterweight and though some transports can be saved. The real extension has a weight of 5 t.
The A-frame now has metal sheaves and the model really is perfectly upgraded with these. When the crane is firstly reeved, it is highly recommended to keep the A-frame under tension, for example by assembling a smaller version of the main boom. This would avoid that the line slips from the sheaves. The A-frame here is not correctly reeved as the real crane. But since the frictional resistance on the model is higher, this reeving simplifies the work and makes the A-Frame easier to move. The opposite site of the superstructure. A small ladder would simplify accessing the superstructure. 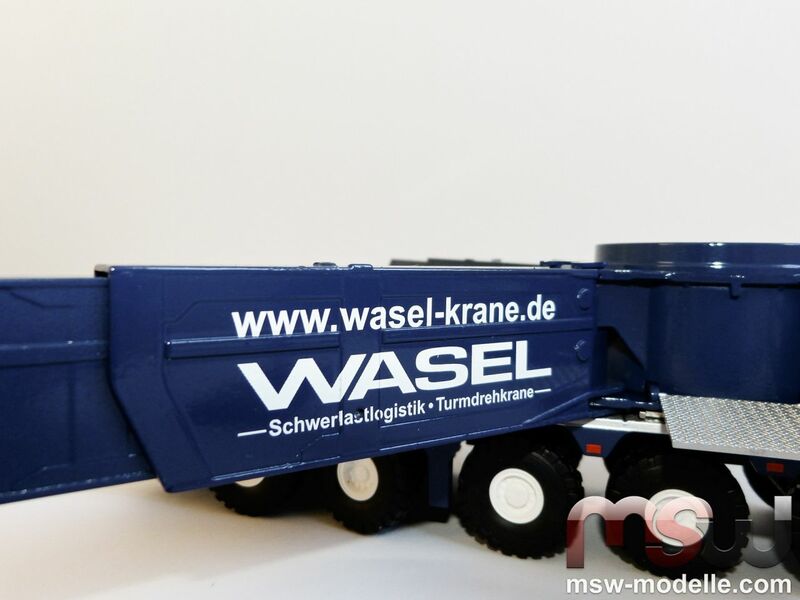 Also here the Wasel logo can be read. The engine exhaust pipe can also been easily seen. A 400 kW Liebherr diesel is installed on the real crane. Walkways with railings are attached to both sides. All railings are made of metal and Conrad copied the cab interior well. At work with SL8HS boom. 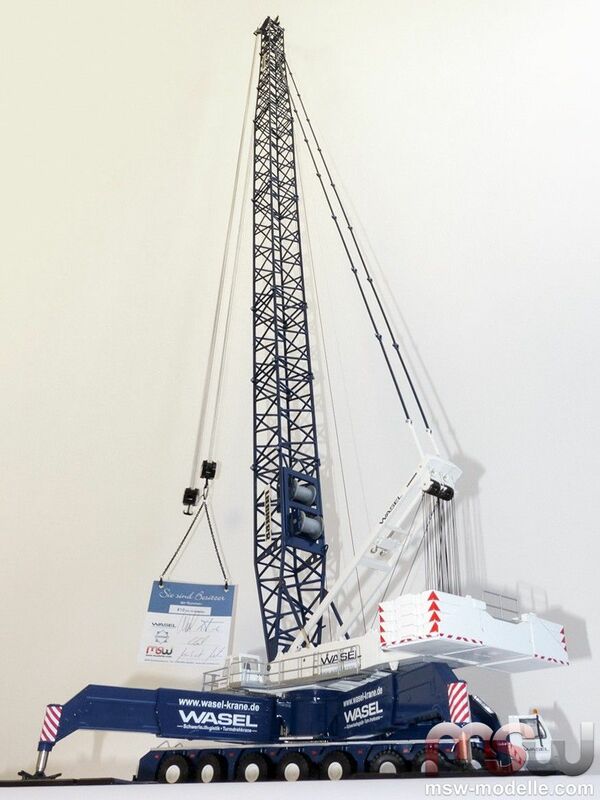 At a reach of 22 m this 84 m boom could lift 100 t in reality. Counterweight here would be 100 t.
The SL8HS-boom head from a closer view. 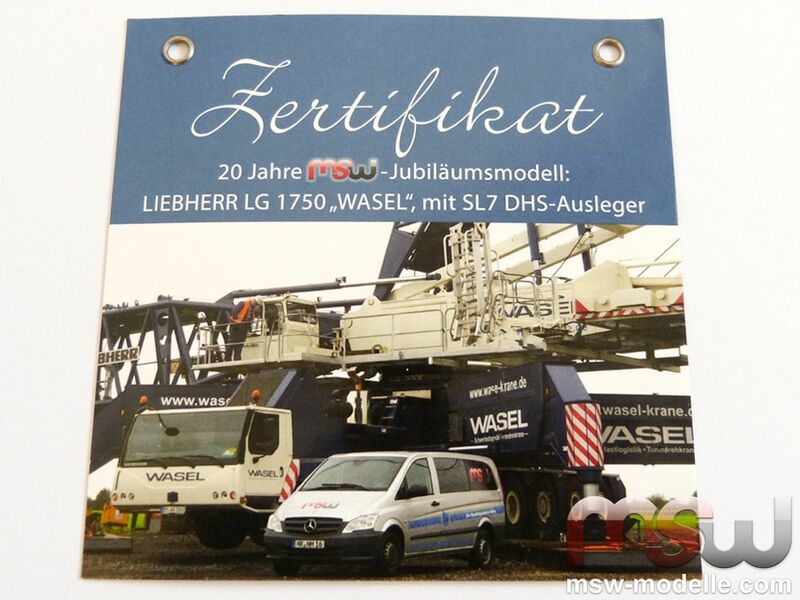 The certificate is really a nice load for this great crane. 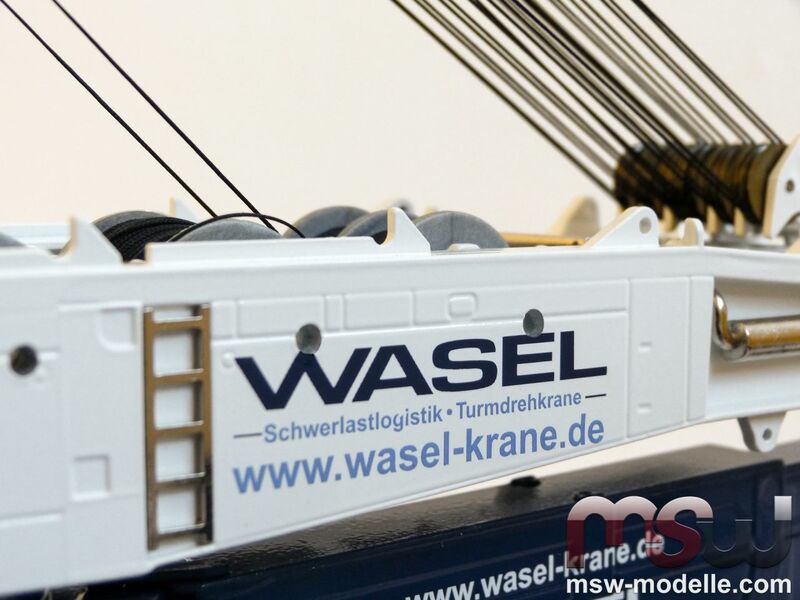 Norbert Mietz also took care of realistic hooks and therefore the LG1750 Wasel comes with the two small hooks. 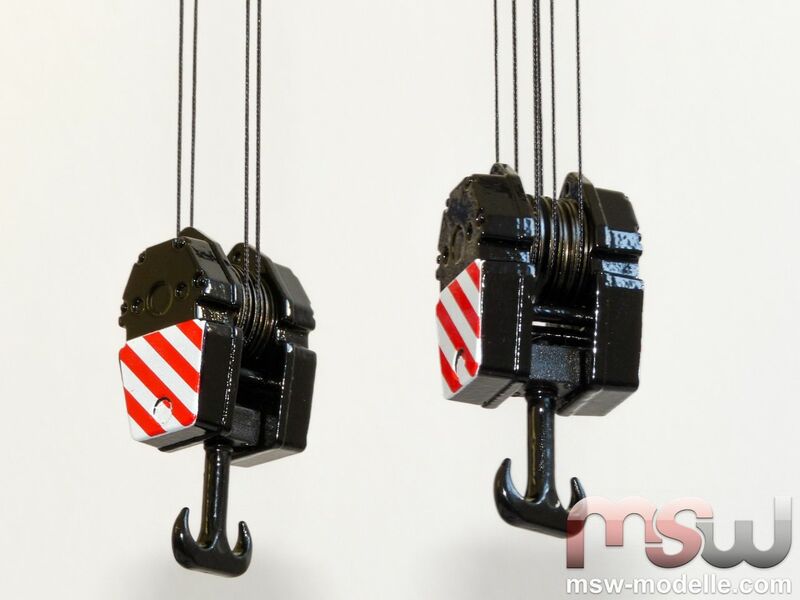 These would be capable for a maximum load of 125 t.
Conrad delivers the hooks with 4 sheaves, which probably has been done due to space reasons. 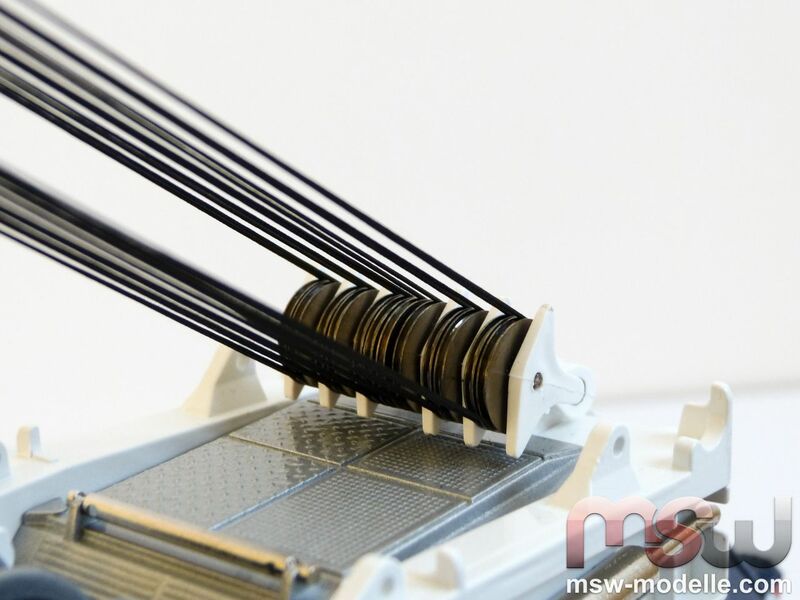 The original hook coming with the previous LG1750 versions Maxikraft had 3 plastic sheaves. Hooks with an even number of sheaves in reality are quite seldom. 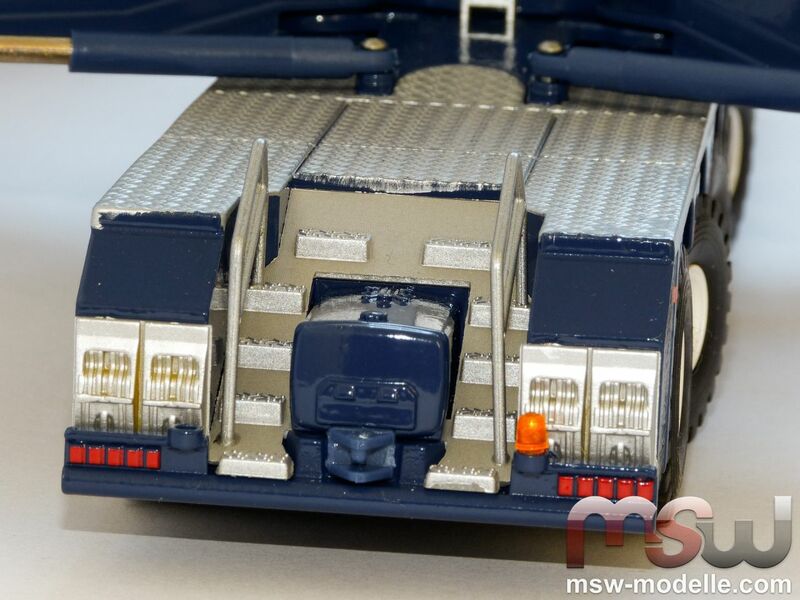 The carrier cab with decals, beacon lights and the small mirrors. Ready for the boom assembly. 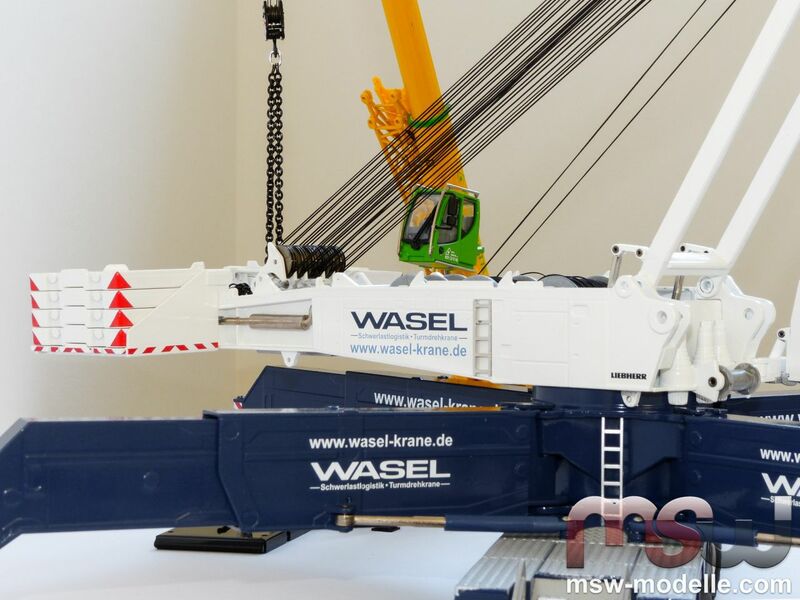 The massive model is safely supported on the crane mats. These are part of the set and would weigh 7,8 t in reality. Ready to work with the two hooks. The sidewalks on the opposite site are also made of zinc. Clearly visible on the superstructure front are also the slew motors.